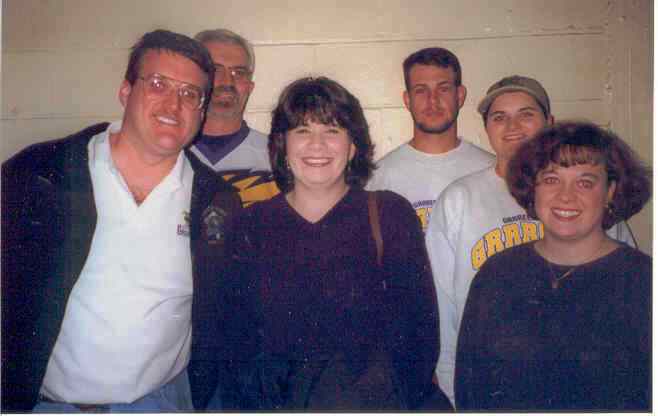 On Friday, 3/12/1999, 20 Grrrowl fans went on a road trip to Louisiana. It was organized by the booster club. I believe this was the first organized overnight trip the Booster Club had orchestrated. Two vans were rented for the trip. We left the Greenville Mall @ 7:00 am that morning. There were many stops on the way down. Much adult beverages were consumed in one of the vans. It was a long ride. Enjoyable, nonetheless, meeting fellow hockey fans. 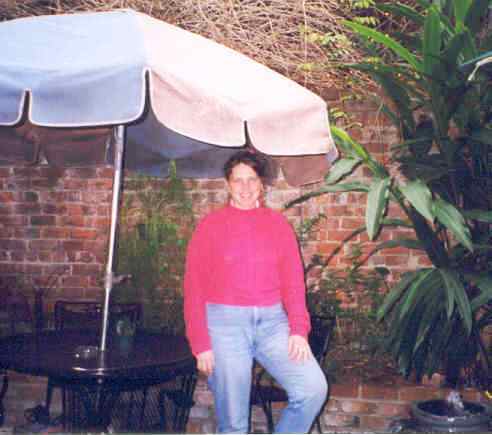 When we finally arrived in New Orleans, we checked into the Days Inn. 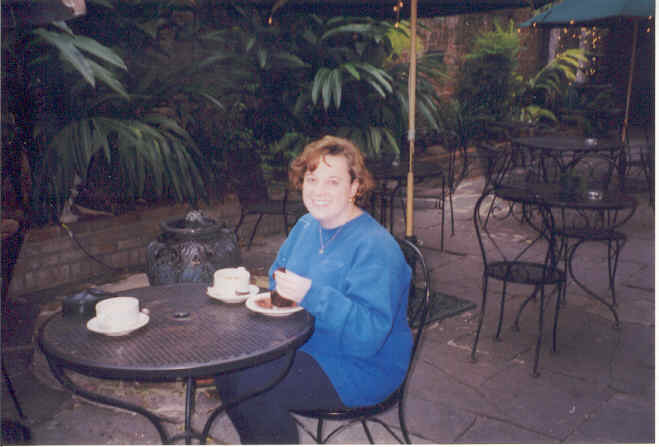 Eve and I walked up to the French Quarter and had coffee in a little courtyard called Royal Cafe. Meg at same Cafe. It was good to get out and away after being so many hours in the van. 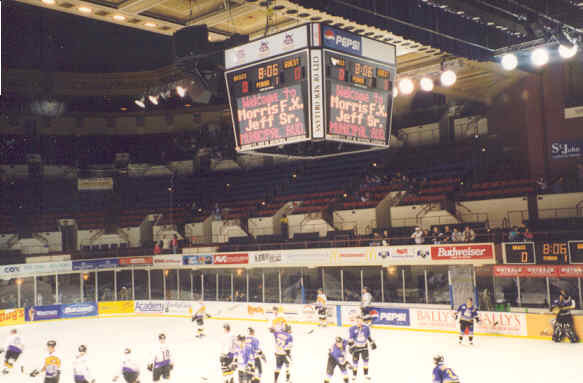 That evening, we all went to the Morris FX Jefferson Municipal Auditorium to watch the Grrrowl play the New Orleans Brass. 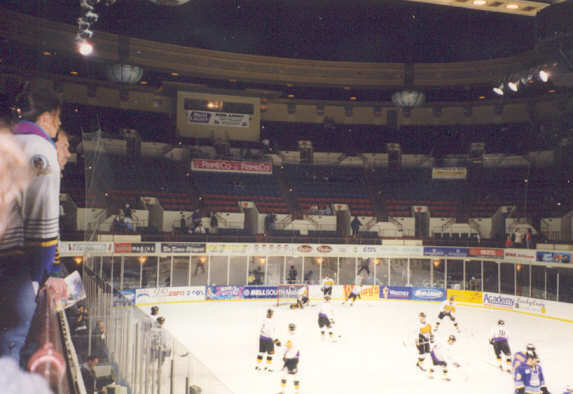 The article in the Times-Picayune read 'Brass Bombs Greenville, 8-2,' the morning after the game attended here. The Grrrowl pretty well got whooped in this game. The Brass played in Morris FX Jefferson Municipal Auditorium. It reminded me of an old converted opera house. The auditorium was not designed for hockey. 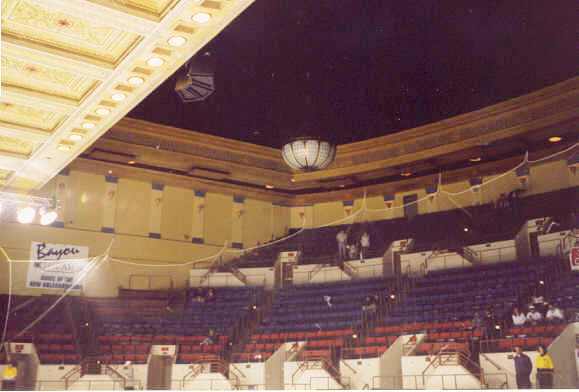 There was a net over the ice area and there were chandeliers hanging down from the ceiling. See below for some snap shots. You can see the net over the ice as well as ornamental ceiling tiles and ceiling crown. Also, another shot of one the chandeliers. Here's one more snap shot of the FX Auditorium. Two chandeliers can be seen in this one. And, Shane Belter (when he had longer hair.) He's one of my favorite hockey players. Eve ended up getting Stefane Souillere's autograph. Made the Grrrowl's loss bearable. Appears the Brass had a player autograph after every game. Kind of cool. So, Eve ended up with Stefane's autograph of her favorite player. I ended up with a miniscule, fuzzy snap shot of mine. Wonder who got the better part of that deal?? Go EVE!!! We went back to the hotel and tried to find a place to eat. We ended up eating at a Ramada just down the road from the Days Inn. There were stories the next morning from some of our fellow road trippers. Something like, the police had to drive a few of them back to the hotel because they got lost.